Daniel Cavagnaro will be organizing the 52nd meetings (2014) and beyond. The information below is for historical reference regarding a previous meeting. Note: The 2013 Meetings are now History! Daniel Cavagnaro and Michael Birnbaum will co-host the 51st meetings in Fullerton February 14-16, 2013. There will be a reception on the evening of February 14, with meetings on Friday and Saturday, Feb 15-16. Note that Monday, February 18 is "President's Day", which is a holiday in the USA and might permit an extra travel day for many American participants. We hope you will accept the invitation to attend, which has more information on the conference. Deadline to submit papers is January 10, 2013. On-Line Paper Submission and Registration for the 2013 Conference. 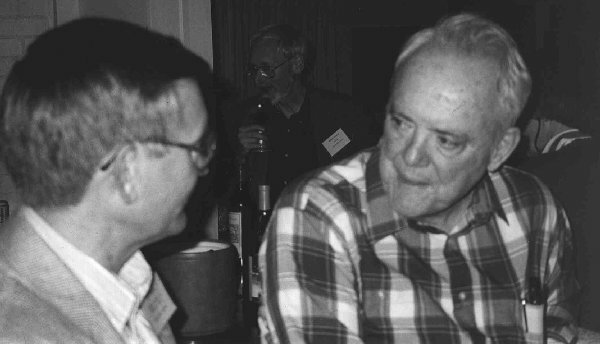 The Bayesian Research Conference was hosted for 41 years by Ward Edwards, and for many years it was held each year in mid-February at the Sportsman's Lodge in Studio City, California. These meetings have been very high in quality, extremely diverse in topic and approach, and under Ward's leadership since 1961, they established a pattern of extremely fruitful, constructive, and congenial meetings. Starting with the 42nd meeting, the event has been held on the campus of California State University, Fullerton. The 44th and succeeding conferences are now the Edwards Bayesian Research Conference, honoring Ward Edwards, a founder of the field of behavioral decision research, who passed away in early 2005. In this picture, Ward and Jim Shanteau converse at an earlier meeting. As Ben Newall (2009) has written, "Ward Edwards is commonly regarded as the Father of behavioral decision making. In two papers, The Theory of Decision Making published in Psychological Bulletin in 1954 and Behavioral Decision Theory published in the Annual Review of Psychology in 1961 he founded and then subsequently gave a name to the field. Then in 1963 he introduced psychologists to Bayesian thinking with his paper Bayesian Statistical Inference for Psychological Research published in Psychological Review. These truly seminal papers have become part of the folklore of the field and their influence can hardly be overstated." To those accomplishments, one might add his paper in the Psychological Review on Subjective probabilities inferred from decisions in which Edwards introduced the idea of probability weighting functions that depend on the configuration of consequences, an idea that is central to Prospect Theory, which was co-authored by his former student, Amos Tversky, and Daniel Kahneman. The 2013 meeting will honor the memory of R. Duncan Luce, a leader in the field of behavioral decision making and a regular participant in this conference, who passed away in 2012.